If you were to trace George Barnett’s many trips across the international dateline, your map might look a bit like a diagram from one of his scholarly articles on global social networks. And that map would, in fact, reflect Barnett’s own extensive network — colleagues around the world who recognize his expertise in a fast-growing area of communication science. During the first five months of a 2015–16 sabbatical, the distinguished professor of communication was a speaker and guest lecturer 11 times in Hong Kong, China, Singapore and Taiwan. Research collaborations also frequently take him to South Korea. The editor of "The Encyclopedia of Social Networks," Barnett specializes in social network analysis to study a wide variety of trends in our increasingly interconnected world. His numerous journal articles and conference papers include findings on the global flows of commercial technology, health information, the destinations of international students, international telephone calls, political blogs and Internet traffic. 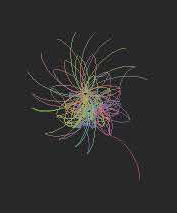 Barnett also has helped develop mathematical modeling methods and other computational tools for analyzing the big data arising ever faster from online communication. Barnett began studying social networks during his doctoral studies at Michigan State University in the early 1970s. At that time, the communication program there was making “a very radical departure” from a traditional focus on speech, rhetoric and journalism. Rather than looking at data use by individuals, social network researchers scour data to study relationships between individuals, corporations and countries. When Barnett joined UC Davis in 2009, he was president of the International Network for Social Network Analysis. He chaired the Department of Communication from 2009 to 2015, overseeing the launch of its new doctoral program and helping shape the department’s focus on communication and information technology. He has directed more than 40 doctoral dissertations and numerous masters’ theses, most at them at State University of New York at Buffalo, where he previously taught. “His enthusiasm for big ideas and innovative research has always attracted large numbers of students,” said Patti Valkenburg, a noted Dutch communication scholar and chair of an International Communication Association committee that selected him for the 2012 Aubrey Fisher Mentorship Award. Barnett has consulted for a number of companies, nonprofit organizations, universities and government agencies—among them, Apple Computer, Beyond War, General Electric and the National Science Foundation. The NSF, Army Research Labs and the Office of Naval Research have funded some of his research. With a $1.8 million grant from the Office of Naval Research, Barnett and three UC Davis colleagues — political scientists Zeev Maoz and Brandon Kinne, and computer scientist Raissa D’Souza — are examining how natural disasters, terrorist attacks and other “shocks” affect social and political networks. In previous studies of the evolution of international telecommunication and Internet use, Barnett has found a few major impacts from world events. For example, after Hong Kong’s transfer to China in 1997, telephone calls placed from the former British colony decreased to the United Kingdom and increased to China. About the images: The colorful graphic, top right, shows the results of a network analysis among countries based on the web citations of the countries' universities to other countries' universities. 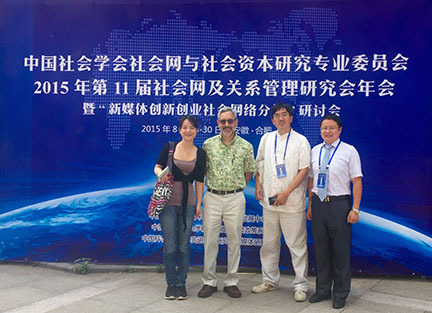 In the bottom photo, Distinguished Professor George Barnett poses for a photo during the August 2015 Chinese Social Networks Conference in Hefei, China, where he was a keynote speaker. Also shown is Ke Jiang, a UC Davis communication doctoral student, left, and two Chinese professors — sociologist Luo Jar-der of Tsinghua University in Beijing, and Jianxun Chu from the University of Science and Technology of China in Hefei.